When migrating geometric network features from data sources that don’t rely on geographic coincidence for network connectivity its sometimes the case that you can get multiple features at the exact same X,Y location. Now we know that in ArcGIS there can only be one feature at a given X,Y that’s connected to a geometric network. So, what happens in this case? Well, one get connected to the network and the second is not. Consider the following example. We have a transition fitting and a reducer at the exact same location. When we move the reducer we see that it is the one connected to the gas network and the transition fitting is not. Given this behavior the next question is, how do we discover these cases? If we’re loading data and the target classes are not yet part of a geometric network, then you might think on building the geometric network that the disconnected feature would be considered a “Build Error” and appear in the “Net_BUILDERR” table. But that’s not the case. Since both features are at a location where they would be considered “snapped” to an edge neither feature is considered a “build error”. Still one is connected and the other not. Here’s where the ArcFM “Duplicate Feature” QA rule can help. If we select out two fitting features and run ArcFM QA on both of them we get the following results. Both fittings have an error that they share a geometry with another feature. Of course in practice to use this in a data migration scenario we would select ALL features from the class in question and run the ArcFM QA on the full selection set to discover cases of coincident geometries. How do we get this QA behavior? This QA rule may not be configured in your particular implementation, but it’s simple enough to add. 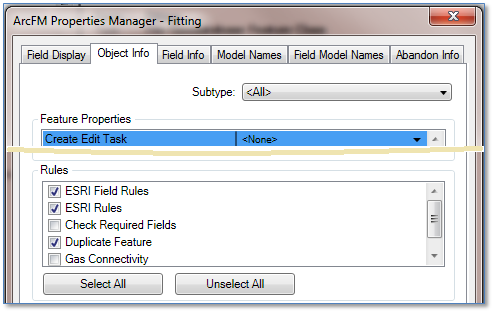 In ArcCatalog on the “Object Info” table of the ArcFM Properties Manager for your feature class, just ensure that the “Duplicate Feature” Rule is checked. This will ensure the QA rule is run any time you do ArcFM QA. Coincident features migrated from non-ArcGIS data sources can sometimes be difficult to track down. While your goal will probably be to fix the disconnected features the first step in the process will be to find the features that are in fact disconnected. 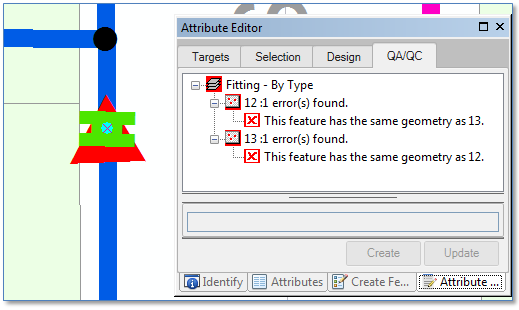 For this step the ArcFM “Duplicate Feature” QA rule can be helpful.